It’s tricky to find a place that airs the game. After doing some online research about venues most likely to air the Super Bowl, I found no actual proof of a place that planned to air it this year (and thus, stay open until dawn). So in the wee hours of a February Monday morning, we headed over to the most promising candidate: The James Joyce Irish Pub. Fortunately, the online forum discussions from 4 years ago didn’t lead us astray, and we found ourselves a bar with a big screen to watch the game. A mostly American crowd filled the TV area, but there were some Turks there too. It was pretty surreal to overhear a heated discussion entirely in Turkish, but punctuated with phrases like “fake punt,” “tight end,” and “special teams”. We didn’t know anyone there. As game time approached, tables with a decent view of the big screen filled up quickly. Our table’s two open chairs were filled by another couple who, by some crazy coincidence, has a travel story super similar to ours: they’ll be in Istanbul from January to April, they’re going to Prague after that, he’s a software developer, etc. He hailed from Argentina, she from Russia (although she grew up in Seattle). They were big Seahawks fans, with the number 12 painted on her face and shaved onto the side of his head. I couldn’t find the Seahawks’ mysterious #12 on the field, but I fortunately had the good sense not to ask why they adorned their heads with Tom Brady’s number (and yes, I eventually figured out who the real Seahawks’ #12 was). While we arrived fairly indifferent about whom to cheer for, I slowly became a Seahawks fan, which I attribute entirely to 1) the awesome people we just met, 2) the fact that Steven Hauschka helped me win money playing Fantasy Football (thanks, Steven! ), and 3) the obnoxious Patriots fans, which included the bro-iest bro we’ve seen in quite some time (and the only bro we’ve seen in Europe, who of course is from the U.S.). There was no food. The game started at 1:30am (or 2:30am Mecca time, according to the Turkish sports channel). So the kitchen was closed. No big deal for us (and for the other patrons, who somehow managed to find sandwiches on the street and bring them in to the pub), as we ended up grabbing some food beforehand. And wow, was the restaurant surprisingly busy at 11pm on a Sunday. There were even kids there! There were no commercials. Wait, that’s not entirely true. We saw the same three commercials every. single. break., each promoting another sporting event to be aired by Turkey’s version of ESPN: a soccer game, a rugby match, and a basketball game. None of them featured puppies. But in true Super Bowl spirit, I analyzed them anyway, deeming the rugby commercial as my favorite. For those familiar with my (Michelle’s) three-year rugby career, this should come as no surprise. So congratulations to the brilliant ad team behind the rugby commercial! You, along with the Patriots, are the winners of this year’s Turkish Super Bowl spectacular. Now it’s 5am, and time for bed. 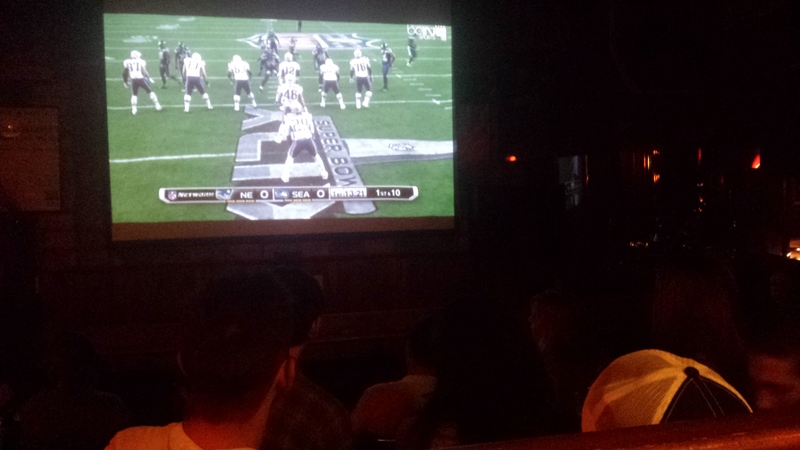 Watching sports abroad is so interesting, we tried to find a NFL game in Prague last fall with little luck. When we were in Norway for the summer Olympics and they showed handball games (matches?) and little else the entire 2 weeks.